Royal Ferns have long fronds with lance-shaped leaves resembling leaves of the ash or locust trees. Royal Ferns spreads slowly, like other Osmundas, but individual plants remain. 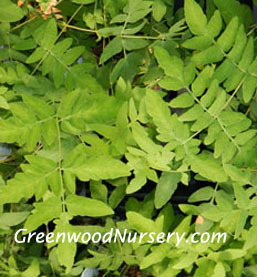 Tips to Grow Royal ferns - they prefer open shade gardens and highly acid, very wet soil. Plants in the Florida wetlands are tree-like and quite impressive. Divide in spring, planting the crowns just at the soil level. Royal ferns are truly regal under the proper garden conditions. Use them as tall accents in the bog garden. Orders shipping to the following states: AZ, CA, CO, ID, MT, NV, OR, UT, WA, and WY are subject to a 20% handling charge due to additional plant preparation and shipping charges and surcharges.